Employment held steady in December and the unemployment rate was unchanged at 5.6%. In the 12 months to December, employment increased by 163,000 (+0.9%), entirely driven by gains in full-time work (+185,000 or +1.2%). Over the same period, total hours worked rose 0.9%. In December, employment increased in Newfoundland and Labrador, while it fell in Alberta, New Brunswick and Prince Edward Island. Little change was observed in the other provinces. While employment held steady overall, increases were recorded in manufacturing, transportation and warehousing, as well as in health care and social assistance. At the same time, there were declines in wholesale and retail trade as well as in public administration. In Newfoundland and Labrador, employment rose by 2,700 in December. The unemployment rate edged down to 11.7%, and the employment rate increased 0.6 percentage points to 51.5%. The number of employed in the province has been slowly trending upward since the spring of 2018. Employment in Alberta fell by 17,000 in December, as losses in full-time work outweighed gains in part-time work. On a trend-cycle basis, overall employment in the province has been increasing since June 2016. In December, the unemployment rate in Alberta was little changed at 6.4%. Following little change in recent months, employment in New Brunswick decreased by 3,100 in December. The unemployment rate rose by 0.5 percentage points to 8.4%. 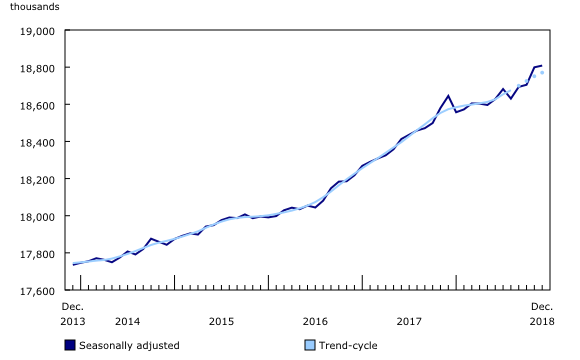 The employment trend-cycle in the province has been relatively steady since the autumn of 2016. Employment in Prince Edward Island fell by 1,200 in December. With more people searching for work, the unemployment rate increased by 1.1 percentage points to 9.6%. 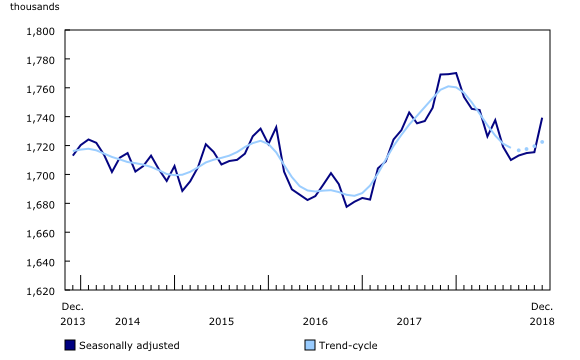 On a trend-cycle basis, employment in the province has levelled off in recent months after a period of growth which began in late 2017. In December, 24,000 more people were employed in manufacturing, with the bulk of the increase in Ontario and Alberta. Nationally, trend-cycle employment in this industry has levelled off in recent months, following a period of decline which began in early 2018. Employment in transportation and warehousing rose by 15,000, continuing the upward trend that began in early 2016. The bulk of the increase in December was in Ontario. There were also employment gains in health care and social assistance, with 11,000 more people working in the industry in December. Most of the gains were in Ontario. On the other hand, 26,000 fewer people were working in wholesale and retail trade, most notably in Ontario. Employment in public administration was down 17,000 in December, with declines in Ontario, Alberta and Nova Scotia. Employment in this industry has been relatively stable for most of the past year. In the fourth quarter of 2018, the number of people employed in the Northwest Territories declined by roughly 1,000 compared with the third quarter, pushing the unemployment rate up 2.7 percentage points to 7.4%. In Yukon, employment was little changed from the third quarter to the fourth quarter. Over the same period, the unemployment rate rose by 0.8 percentage points to 4.0%, the result of more people in search of work. Employment in Nunavut was little changed in the fourth quarter, and the unemployment rate was 15.1%. In 2018, employment increased by 163,000 or 0.9%. This pace of growth was slower compared with 2017 (+2.3%) and 2016 (+1.2%). Over the course of the year, the unemployment rate fell 0.2 percentage points to 5.6%—the lowest rate since comparable data became available in January 1976. Full-time employment continued on an upward trend in 2018, growing by 185,000 or 1.2%, while part-time employment was little changed. In Ontario, employment grew by 78,000 (+1.1%) in 2018, all in full-time work. The unemployment rate in the province edged down 0.2 percentage points to 5.4%, the second lowest rate among the provinces. Employment gains were recorded in several industries, led by transportation and warehousing, and educational services. These gains were partially offset by declines in wholesale and retail trade as well as in information, culture and recreation. In 2018, employment in British Columbia increased by 44,000, almost entirely in full-time work. Employment grew by 1.8%, double the national average, while the unemployment rate edged down to 4.4%, still the lowest among the provinces. Employment gains were spread across several industries, led by professional, scientific and technical services. At the same time, declines were recorded in finance, insurance, real estate, rental and leasing. Following losses in late 2015 and early 2016 in the aftermath of declining oil prices, employment in Alberta recovered in 2017 (+55,000 or +2.4%). Employment continued to grow in 2018, up 22,000 (+0.9%). All the gains in 2018 were in full-time work, and were spread across a number of industries. The unemployment rate in Alberta fell from 7.0% at the end of 2017 to 6.4% at the end of 2018. In Saskatchewan, employment rose by 11,000 (+1.9%) in 2018, entirely in full-time work. At the same time, the unemployment rate fell 0.9 percentage points to 5.6%. Employment gains were observed in several industries, led by agriculture. In Manitoba, employment grew by 6,900 (+1.1%) in 2018, all in full-time work. The unemployment rate increased by 0.4 percentage points to 6.0%, the result of more people looking for work. A number of industries showed employment increases, led by transportation and warehousing. 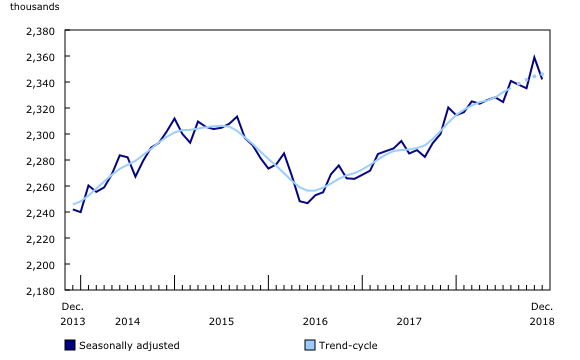 Following robust growth in 2017, employment in Quebec was unchanged in 2018. With more people looking for work, the unemployment rate increased by 0.5 percentage points to 5.5% at the end of 2018. 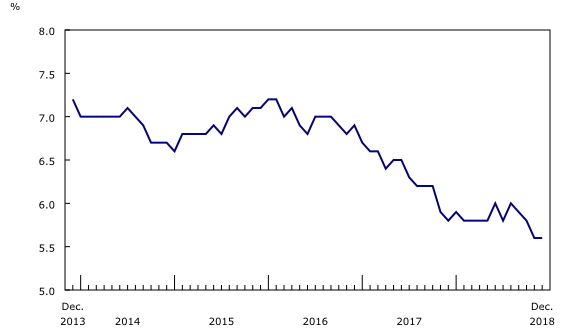 After little change in 2017, employment in New Brunswick fell by 5,100 (-1.4%) in 2018. The unemployment rate rose slightly to 8.4%. Among the core-working-age population (aged 25 to 54), employment in 2018 increased more notably for women (+126,000 or +2.2%) than for men (+61,000 or +1.0%). At year end, the unemployment rate among this age group was 4.6% for women and 4.8% for men. For men and women aged 55 and over, employment rose by 50,000 (+1.2%) in 2018, with most of the increase among men (+43,000 or +2.0%), whose unemployment rate fell 0.8 percentage points to 5.3% over the period. For women in this age group, employment was little changed, as was their unemployment rate of 4.6%. In 2018, employment among young people aged 15 to 24 was down 73,000 (-2.9%), following gains the previous year. With little change in the size of their population, young people saw their employment rate fall by 1.9 percentage points to 55.3% at the end of 2018. On the other hand, their unemployment rate increased by 0.6 percentage points to 11.1%. Following strong growth in both goods and service industries in 2017, overall employment gains in 2018 were recorded almost entirely in service industries, including health care and social assistance (+74,000 or +3.1%); business, building and other support services (+59,000 or +7.8%); transportation and warehousing (+56,000 or +5.7%); and educational services (+33,000 or +2.6%). At the same time, employment fell in wholesale and retail trade (-67,000 or -2.3%); information, culture and recreation (-37,000 or -4.6%); manufacturing (-30,000 or -1.7%); as well as finance, insurance, real estate, rental and leasing (-30,000 or -2.5%). Employment in natural resources held steady in 2018, following gains in 2017. In 2018, the number of private sector employees increased (+101,000 or +0.8%), while public sector employment was little changed and self-employment edged up. The Labour Force Survey (LFS) estimates for December 2018 are for the week of December 2 to 8. A standard revision to the LFS data will be released on February 1, 2019. The LFS seasonally adjusted estimates will be revised back to January 2016 using updated seasonal factors. The next release of the LFS will be on February 8, 2019. Labour Force Information (Catalogue number71-001-X) is now available for the week ending December 8. The product "Labour Market Indicators, by province and census metropolitan area, seasonally adjusted" (Catalogue number71-607-X) is also available. This interactive dashboard provides easy, customizable access to key labour market indicators. Users can now configure an interactive map and chart showing labour force characteristics at the national, provincial or census metropolitan area level. A labour-market update on immigrants is available in the report entitled "The Canadian Immigrant Labour Market: Recent Trends from 2006 to 2017." A summary of the update was released in The Daily on December 24, 2018. To enquire about the concepts, methods or data quality of this release, contact Lahouaria Yssaad (613-951-0627; lahouaria.yssaad@canada.ca) or Vincent Ferrao (613-951-4750; vincent.ferrao@canada.ca), Labour Statistics Division.